In Power BI, you can use the pre-defined function CALENDARAUTO() to create date table with a column called “Date”. It will generate a date for current 1 year by default. 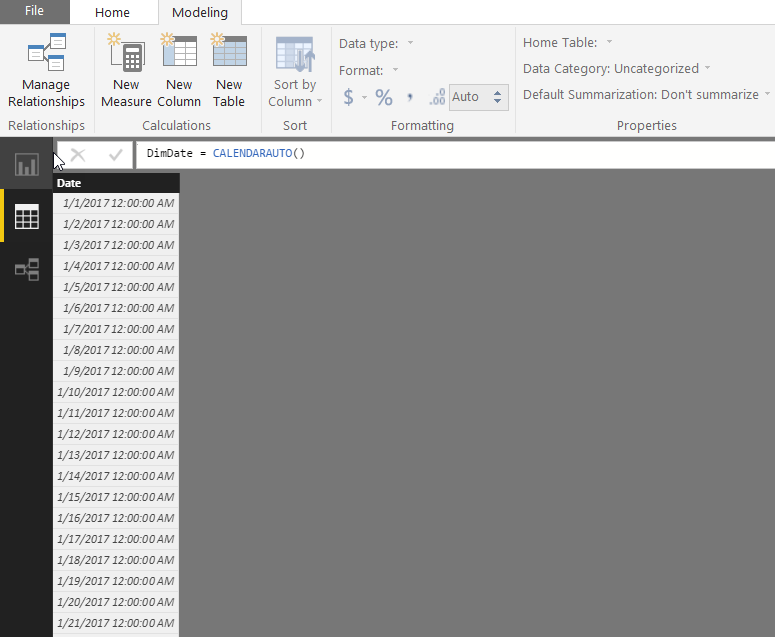 This above function will only work when you have a model with at least one column with date or datetime data type. In the below screenshot, I tried to use CALENDARAUTO() function in an empty model. You can see the warning message above. In the same scenario, I just added a simple table with one date data type column then I used the CALENDARAUTO() in a new table and this time I got the expected result. Happy Learning. Share your comments. 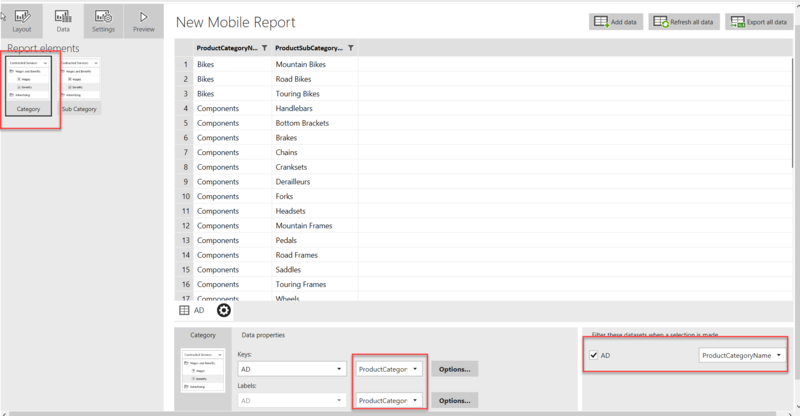 This article explains you the possibilities of passing the parameters in mobile report URL. If you have multiple parameters in your dataset then you need to add “&” symbol followed by your first parameter. To pass multiple values to single parameter then we need to repeat the same parameter with different values. To pass multiple values to multiple parameters then we need to repeat the parameters with different values. We can pass multiple values with just comma separated. It eliminates the scenario of repeating the parameter with different values. To get this solution, need to set up the shared dataset to support multiple values. The reason for using the stored procedure is to pass “ALL” values instead of trying all values with comma separated. 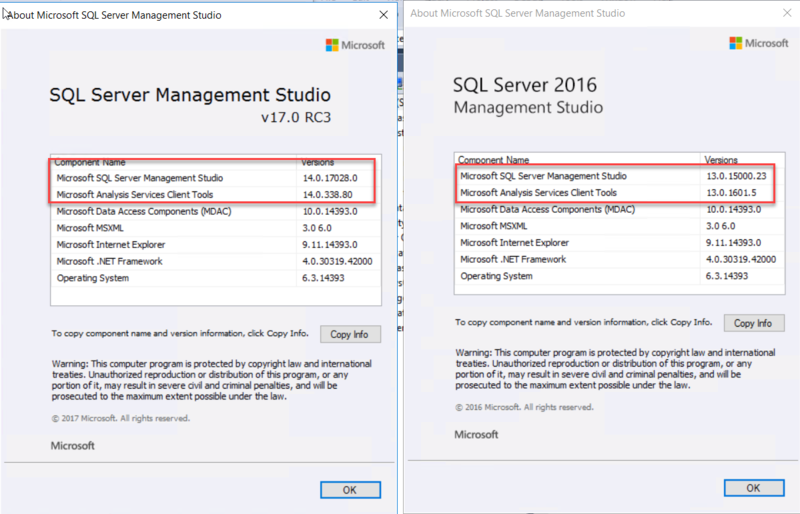 Microsoft SQL Server 2016 Reporting Services has multiple new features. One of the features is Branding. It enables us to customise the Report Manager Portal with our preferred colours, logo and custom colours for mobile reports, etc. You need two files to make your own branding. The template for the above files are available in online. You can download here and start to customise it. There is a possibility that you can get the below error. Actually, this error is self-explanatory and the solution is very simple. Need to zip the above 2 files and upload that in Report manager branding section. If you are stored the files in a folder and zip the whole folder and try to upload in branding then you will get the above error message. Select those files and right click and choose to send to ->Compressed. Now you can upload the file. 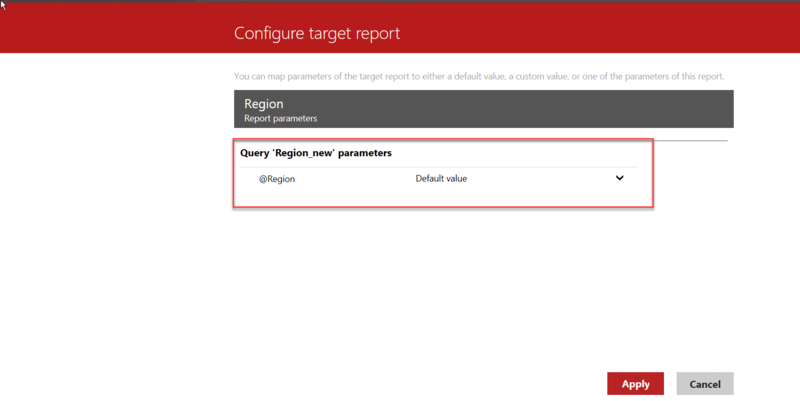 Configuring a cascading parameter for SSRS report is easy. We used to play with multiple datasets. To make it simple, if we have two parameters in a report, the second parameter values are based on first parameter selected value. I have following two parameters in a report. Country Parameter will show all the available country and city parameter will show all the cities irrespective of country. In a business scenario, this needs to be fixed as users will expect to see only cities relevant to the countries. If user Selects India, then the city should show only the cities from India. 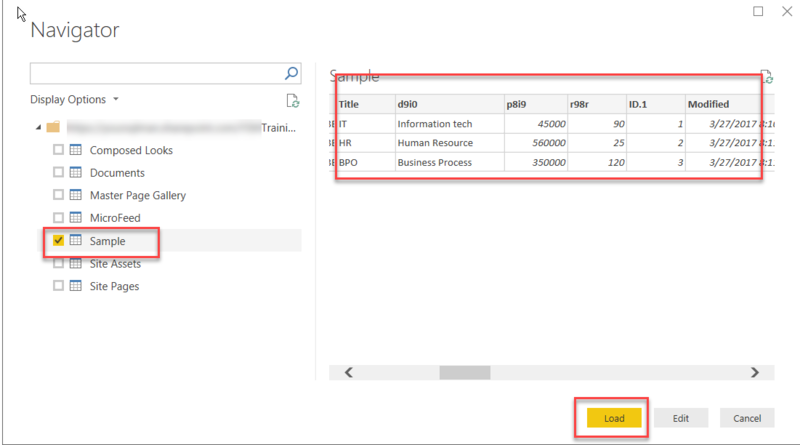 Check out my below post for cascading parameter in SSRS report. The same logic can be applied in SSRS mobile report but with different procedure. In this scenario, I am taking AdventureWorksDW database for better understanding. Step 1: Create a shared Dataset and deploy to report manager. Step 2: Open Mobile report publisher and add the shared dataset. In this case dataset from AdventureWorksDW database. Step 3: Drag and Drop two selection list. You can maximise or minimise to show only one value at a time as like below. Step 4: Go to Data and Add data. Here I added a shared dataset which contains Product Category Name and Product Subcategory Name fields. Step 6: Choose our dataset for both the selection lists. Make sure to choose Category Key and label for selection list 1 and Subcategory Key and Label for selection list 2. Step 7: Add the checkbox on “Filter these dataset when selection is made”. Choose the Product Category. Step 9: By default “Allow select all” option is ON, now off for both the selection list. Step 10: Preview the report. You can check the sub category shows only Bike information. If we choose some other value in category then it will show respective sub category results. 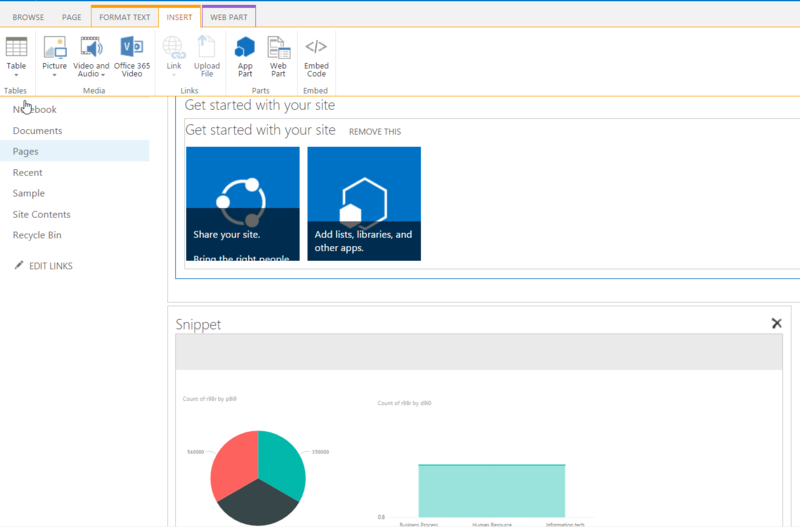 This article explains to you that how we can use SharePoint list as a source for Power BI and also extending the Power BI report to embed on SharePoint. I am following the same strategy in all my blogs. Reading a big paragraph is tough than a step by step points as it is easy to follow and remember. Step 1: Create a SharePoint list as per your business needs. It can be simple or complex with calculated columns. In my case, I created a simple SharePoint list with some sample content as like below. Step 2: Get the SharePoint URL where the list is created. 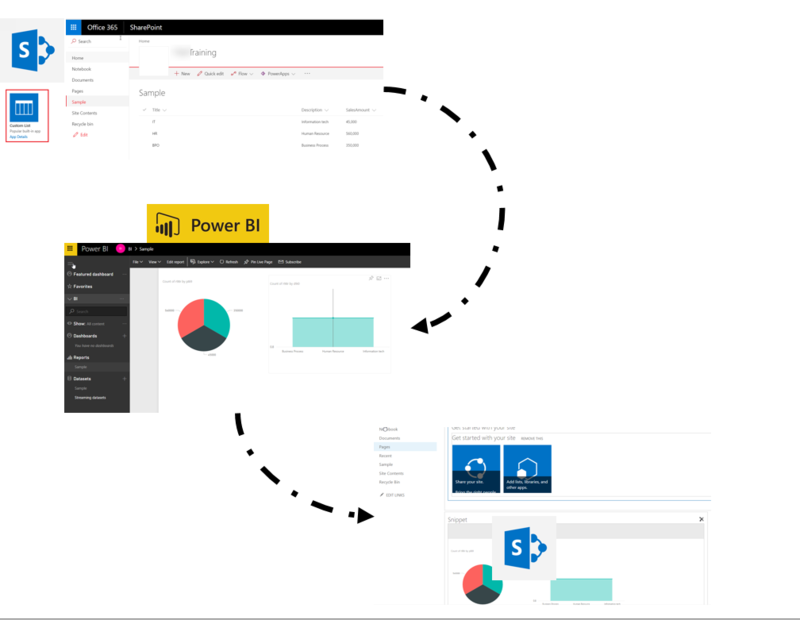 Step 3: Open Power BI Desktop and click Get Data. Step 5: Pass the O365 SharePoint URL and credentials. Step 6: Choose the list and click Load. Step 7: It will load all the columns from the SharePoint list. Choose the visualization and map with the respective fields. 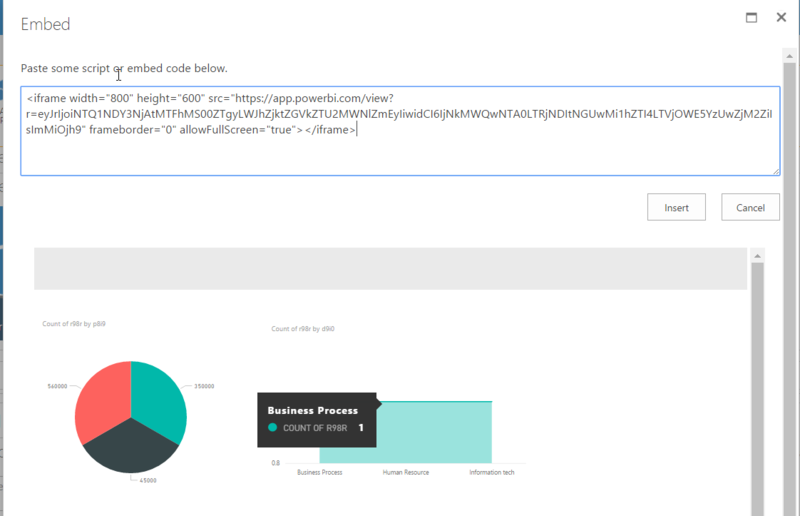 Step 9: Login to app.powerbi.com with your credentials. Step 10: Open your report from your workspace where you published. So far, we created a report using SharePoint list. 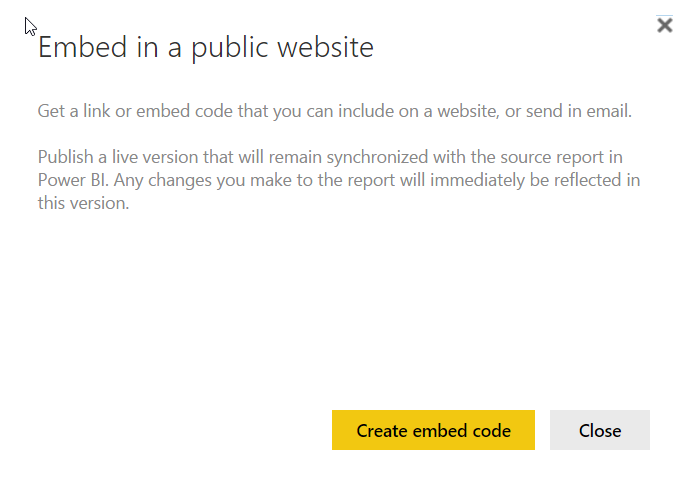 Now we are going to embed the report in SharePoint. Step 2: If we have O365 E series license then we can use “Embed in SharePoint Online (preview)” option otherwise choose the below option. Step 3: It will ask you to publish. 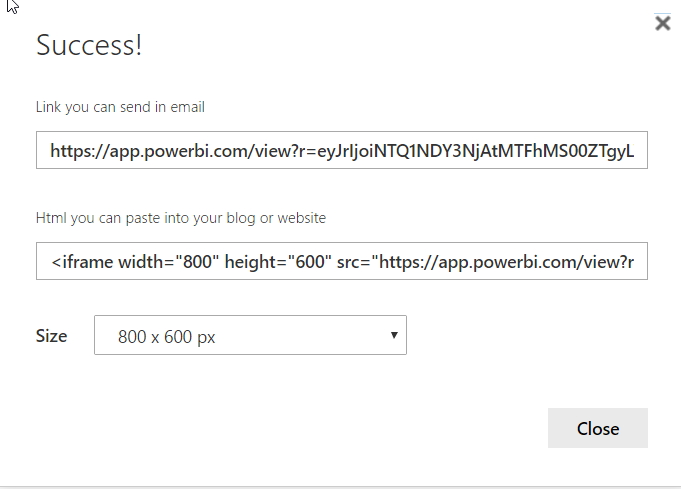 Step 4: Finally, it will generate URL and iframe code to place on any web page of SharePoint. 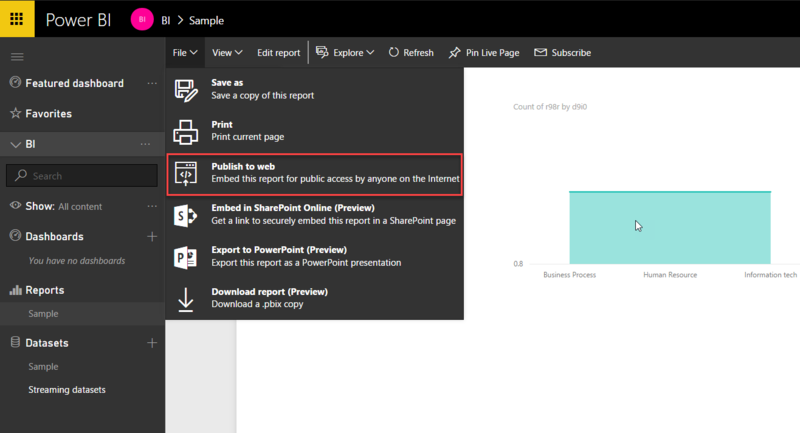 Step 5: Go to SharePoint page and edit where you want to embed this report. Step 8: Save the page.